In January of 2015, Davis had put the developer, Neville Anderson, in touch with the land owner, Don Hammond, for the specific purpose of developing the solar farm. Davis then initiated the effort to get the county to change its zoning laws to allow for construction of the solar farm on the agriculturally zoned land. The Board of Commissioners approved those changes on March 1. Davis also has worked more recently behind the scenes to provide fellow commissioners with information supportive of the special use approval for the solar farm that property owner Hammond is seeking from the county. Commissioners William “Bubber” Wilkes and Mark Saxon, the only commissioners other than Davis eligible to vote after the public hearing on Dec. 6, refused to go along with Davis’ effort, putting off until the Commission meeting on Jan. 3 a decision on the request. 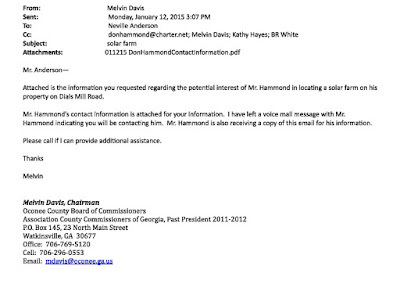 Davis’ role in promotion of the solar farm is in evidence in an email chain I obtained through open records requests I filed on Dec. 13. UDC stands for Unified Development Code. I received responses from Davis and from B.R. White, director of the Oconee County Department of Planning and Code Enforcement, on Dec. 16. Most of the informative documents were in the files provided by White, though they were written by Davis before the time period I specified in my request for access to his correspondence. The email message Davis sent to Anderson, for example, came from an email chain I obtained from White. I did not receive the attachment as part of my open records request. Davis also copied Hammond in on the email. On Jan. 12, 2015, the proposed use of the agricultural land for a solar farm would not have been possible given the UDC in place at that time. It also is unlikely the land could have been rezoned for industrial use, where a solar farm might have been possible, given that no other industrial properties are in the area. Anderson responded to Davis on Feb. 5, 2015, copying his response to Hammond. 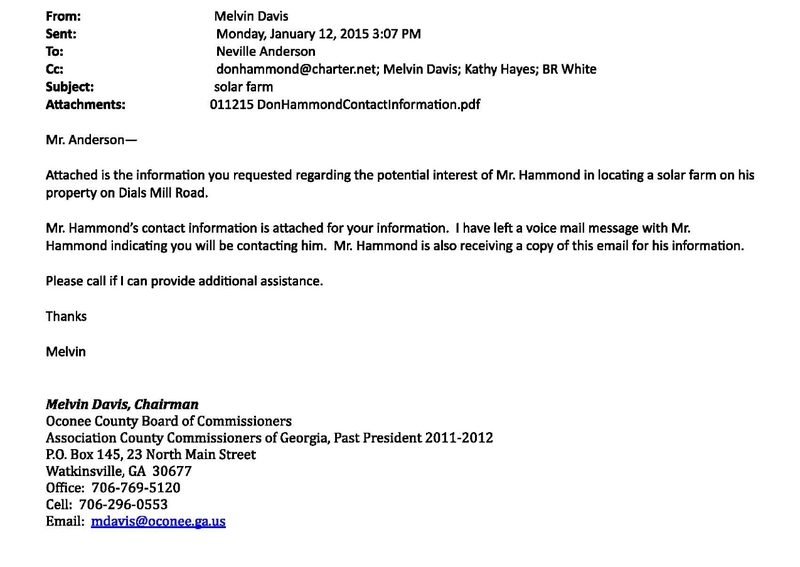 “Do you think you could grant me a few minutes on your calendar in the near future to discuss solar in Oconee County,” Anderson said in that email to Davis. Anderson indicated he had spoken with both Walton EMC and Southern Company “transmission folks” about the possible project. Anderson sent his email message at 2:08 p.m., and Davis wrote back at 4:38 p.m.
Will February 19th at 3:00 PM work for your schedule? I will request our Planning Director, BR White, to be present for the discussion, if his schedule permits. Davis had copied Planning and Code Enforcement Director White in his response, as had Anderson in his request for the meeting. Davis also copied County Administrative Officer Jeff Benko, to whom White, according to the county’s organizational chart, reports. Benko sent White an email message at 5:20 p.m. on Feb. 5. “If you do not want to attend let me know!” Benko wrote to White. White responded to Benko at 7:56 a.m. on Feb. 6. He did not copy anyone. “I can do it,” White said of the meeting. Anderson, 1131 Tanglebrook Drive, off Epps Bridge Parkway near the McNutt Creek border with Clarke County, is managing director at Green Energy Partners LLC and president and CEO of Rural Green Power LLC, according to his LinkedIn entry. Hammond owns 199 acres west of the intersection of McNutt Creek Road and Dials Mill Road north of U.S. 78, under the name Mr. Chick Farms Limited Partnership of Gainesville. The original plans had called for the placement of solar panels across nearly all of the acreage in the two parcels, converting them from green farmland to solar receptors. In the revised plans to be considered by the Board of Commissioners at its meeting on Tuesday night, only the 199-acres will be covered with the panels. Prior to the changes approved by the Board of Commissioners on March 1, 2016, the county’s Unified Development Code made almost no reference to solar energy and did not specify what might be done with a proposal for a solar energy farm. The Commission changed that on March 1. The BOC held two hearings on a series of changes to the UDC, on Feb. 23 and again on March 1. The Planning Commission also held a hearing on the changes on Feb. 15. Tucked into those UDC changes was considerable new language on solar energy, including the crucial provision that solar energy farms could be on land zoned for industrial use or on agricultural land. The agricultural use required a special use approval. “Awesome! We have the site and funding ready,” Anderson replied. Wayne Provost, then director of Strategic and Long-Range Planning, had written to White on several occasions going back at least to June of 2014 advising him that the county needed to think about how to handle solar farms. Work progressed following the meeting with Anderson in February of 2015, and White kept Anderson informed of the progress. On Feb. 3, White sent Anderson a link to the proposed ordinance change under consideration. Planning and Code Enforcement Director White also had kept the members of the Board of Commissioners informed about the proposed changes in the UDC. White made specific reference to solar farms, saying he was still trying to figure out how much of a link there should be in the document to residential use of solar panels. “Please let me know if you have questions,” he wrote. The Oconee County Planning Commission on Nov. 14 voted 6 to 0 not to recommend to the Board of Commissioners the special use for the solar farm, following comments from citizens raising a number of concerns about negative impact of the project on nearby residential neighborhoods. On Nov. 28, Davis asked Allen Skinner, chief appraiser with the Oconee County Property Appraisal Department, to do an analysis of the tax impact of the solar energy farm. Skinner wrote back the next day saying the two parcels being considered produced only $2,272 in taxes in 2015 but would produce “approximately” $12,824 if they were used for a solar farm, plus an estimated $129,933 in personal property tax. Davis thanked Skinner for "providing this information. Very informative." He forwarded Skinner’s email to the commissioners the next day. Georgia Public Services Director Tim Echols also weighed in, with a letter to Davis and the other commissioners on Nov. 28. Commissioner Luke, whose wife’s family owns property in the area of the proposed solar farm, recused himself at the BOC meeting on Dec. 6, leaving only Saxon and Wilkes as voting members. At that time, Post 2 was vacant. Davis, who could vote in the case of a tie, needed only one vote from Saxon or Wilkes to get the project through, but he couldn’t get it. Wilkes is a vocal supporter of Davis, but he said he wanted to wait until January to make a decision because he had not had a chance to look at the changes to the plans submitted that evening. Those changes dropped the smaller tract and specified some buffer agreements. Saxon said the plans had been changed “a little bit” but that was not the issue for him. OCO: Wilkes And Saxon And Solar Farm from Lee Becker on Vimeo. The two voted to delay the decision until Tuesday night, when Saxon and Wilkes will be joined by new commissioners Chuck Horton and Mark Thomas. Daniell, rather than Davis, who retires today, will be BOC Chair. So glad to see December 31 come and have the sun set on the Davis reign. Can't wait to see how John Daniell will fill this post. A whole lot more "openly" I hope. I knew this deal had been going behind the scenes for a while. This new information now validates my analysis. This is another example of most politicians telling you one thing then executing the total opposite thing. Hopefully the new Board membership with the addition of different leadership might get things back on track for the county. Maybe a solar farm is a clean, quiet, friendly use of the acreage. Then why the appearance of subterfuge? Let's lay odds on a forensic accounting of our county in our future. Solar energy is overall a positive - we need power and the sun is a great source. A solar farm would benefit the environment in many ways and would be a quiet, low maintenance neighbor. I don't think the problem is the solar farm itself. The problem is how Mr. Davis worked to move the idea forward, conversing only with the interested parties, not involving the public. An amazing try on his part to get this done before he left office, subterfuge to the end. Now the property owner, the solar developer, the neighbors, and the current commissioners have all been misled and a project that might have worked, will end up generating disappointment, regardless of the outcome. I sure hope Mr. Daniel does not operate this way. Question: Will the Oconee Enterprise even cover this? What would we do without Lee Becker? Please plan on attending Tuesday night. I can promise you that it will not be boring. The Commission approves changes to the UDC on March 1st, 2016. On March 2nd, BR White e-mails developer Neville Anderson "We look forward to working with you". Wow, an e--mail the next day; that was sure quick! Who exactly do you represent Mr. White? Kinda thought your salary is paid for by county residents. Also, seems like BR White is crossing over to Economic Development. Oy vey, what a disaster. How many other projects are ongoing behind closed doors that are being intentionally kept from the public view? Any more mega Master Planned Developments that will need brand new schools to be built? How many Open Records requests will Lee have to perform before there's sunlight on the county government? The record shows that White responded to a request from Benko, his supervisor, to attend the meeting that initiated the UDC changes. Benko was responding to an email from Davis, who is Chair of the Board of Commissioners. Benko reports to the Board of Commissioners. The involvement of the other commissioners isn't clear from the email trail. Think about this: All it took was a developer to send an e-mail ("grant me a few minutes on your calendar") to Davis, and then have a meeting with Davis and BR White, for the county to change the Unified Development Code to accommodate that developer's business interests. Again, the ultra-important Unified Development Code was changed all from a developer contacting Davis, and then having a meeting with him and BR White ("to discuss solar in Oconee County"), and changes were made to benefit a specific project for an Athens developer and a property owner from Gainesville. Davis wrote back at 4:38 p.m.
Why are comments being deleted from this thread? Interesting and tough questions asked here. I have not deleted any posted comments. Weird, there were 12 comments on this thread yesterday, then ten today.